I am super excited to share that Wyatt’s story will be a part of an amazing box set releasing in May. 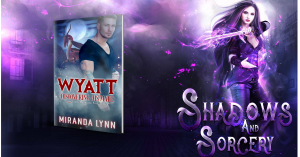 I have joined more than 20 other authors to bring you a set of amazing stories all within the realm of urban fantasy, paranormal, and fantasy. But I am here to talk about Wyatt and his story. My dear dragon shifter has lived a life of personal solitude. He has few friends and lives for his job. I decided it was time to show him that no matter what has happened to you, what you have been told, you can still find your happiness.If you are only willing to acknowledge and recognize it. Their will be bumps in the road and he will have to learn to forgive. He will have to make a choice that will change his world forever. We all go through those struggles, those pivotal moments we don’t even realize are happening. I take those moments and give them the endings we all dream of. Each story in this paranormal world is dear to my heart for it’s own reason. The pack itself is representative of how we need to be in real life. Accepting of those that aren’t just like us, that don’t have the same ideas or beliefs. This world is built on love and respect, order and rules, and creative freedom. If you want a glimpse into this world, check out my other titles within the Black Mountain Pack on the series page. 24 of today’s bestselling authors have joined forces to bring you some of the best DARK PARANORMAL and URBAN FANTASY in the genre. So dear reader, take a chance on my dragon and the stories of over twenty other worlds. Pre order your copy today for only 99 cents! Next: Next post: Convention Wrap up and What’s up next. To stay up to date on all my book news, and to get access to exclusive giveaways & contests, sign up for my newsletter. Convention Wrap up and What’s up next.